We’d love your help. Let us know what’s wrong with this preview of Brand Luther by Andrew Pettegree. To ask other readers questions about Brand Luther, please sign up. Pettegree's book covers fairly standard Luther biography ground, but with a unique twist: he regularly explores how the developing German printing industry was an invaluable aid to the Reformation and in particular Luther, and likewise how at the same time Luther himself was an interested, involved, and invaluable help to the printing industry. This probably isn't the best first biography of Luther to read: that would be either the classic Roland Bainton biography or the more recent one by Scott Pettegree's book covers fairly standard Luther biography ground, but with a unique twist: he regularly explores how the developing German printing industry was an invaluable aid to the Reformation and in particular Luther, and likewise how at the same time Luther himself was an interested, involved, and invaluable help to the printing industry. This probably isn't the best first biography of Luther to read: that would be either the classic Roland Bainton biography or the more recent one by Scott Hendrix: Martin Luther - Visionary Reformer. However, this text is great for learning a bit more about the process of the Reformation. Also, unlike the above books, Pettegree spends time exploring the 100 years following Luther's death and the trials and victories of the Reformation and printing-industry causes during that time. For years the newfangled printing press was only utilized by the church, for the church. Small local publishers turned out books in Latin that had little in common with what we expect in a book today, like consistent and grammatically correct word breaks. The development of the book as we know it was due to Lucas Cranach who created title pages with decorative elements,with the author's name prominently displayed. And he developed this format for his friend, Martin Luther, best-selling writer of For years the newfangled printing press was only utilized by the church, for the church. Small local publishers turned out books in Latin that had little in common with what we expect in a book today, like consistent and grammatically correct word breaks. The development of the book as we know it was due to Lucas Cranach who created title pages with decorative elements,with the author's name prominently displayed. And he developed this format for his friend, Martin Luther, best-selling writer of the early 1500s. 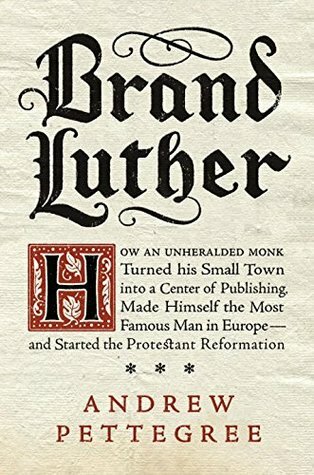 Andrew Pettegree's title tells the whole story: Brand Luther: How an Unheralded Monk Turned His Small Town into a Center of Publishing, Made Himself the Most Famous Man in Europe--and Started the Protestant Reformation. The book tells the stories of a monk turned best-selling author, a one-customer book industry that found an explosive new market, and how a small town became a boom town. I learned in my Reformation History course that Luther was a Cultural Icon, a mass-media guru who used the latest technology--and gasp, even wrote in the vernacular so non-clerics could read theology and the Bible! Pettegree has a readable style and his presentation of the history and theology was not difficult to follow. Although not a biography of Luther, or a study in Reformation history, the reader will learn a great deal about both. Included in the book are illustrations, including the books discussed, and portraits of Luther by Cranach. I received a free ebook from the publisher in exchange for a fair and unbiased review. How can an unpublished, obscure Roman Catholic monk move from the shadows to the world stage in a matter of years. This is the subject of Andrew Pettegree’s book, Brand Luther. Pettegree walks meticulously through the events of the Reformer’s life; events that would mark a nation and rock the world. This is Brand Luther. The author sets the stage by alerting readers to Luther’s fascinating background. From his birth in Eisleben to his university days in Erfurt, and his teaching days at in Witten How can an unpublished, obscure Roman Catholic monk move from the shadows to the world stage in a matter of years. This is the subject of Andrew Pettegree’s book, Brand Luther. Pettegree walks meticulously through the events of the Reformer’s life; events that would mark a nation and rock the world. This is Brand Luther. The author sets the stage by alerting readers to Luther’s fascinating background. From his birth in Eisleben to his university days in Erfurt, and his teaching days at in Wittenberg, Pettegree establishes Luther’s cultural context along with vivid allusions to the theological landscape. Ultimately, his design is to show how Luther rises to prominence in a most unusual way. Brand Luther is unique in that it captures the pathos of the 16th century. The author delves into matters that pertain to culture, theology, economics, and personal emotion - to name a few. The author has an uncanny ability of navigating readers on the path that Luther walked and placing them in the emotional state he experienced and the physical ailments he endured. The turmoil that Luther felt and the threat of impending death looms like London fog on a cold autumn evening. The author argues that Luther’s writing along with the establishment of the printing press are integral to his success, not to mention the gains of the Protestant Reformation: “Many things conspired to ensure Luther’s unlikely survival through the first years of the Reformation, but one of them was undoubtedly print.” The book is filled with evidence that points in this direction which bolsters the author’s thesis along the way. Brand Luther is a serious work of history which spans nearly 400 pages but the book reads like a novel - quite an accomplishment for a scholarly work! Essential reading for students of the Reformation! A somewhat scholarly but nevertheless fascinating account of how Martin Luther became a best-selling author by brilliantly using the fledgling German printing industry to spread the idea of the Protestant Reformation, thereby simultaneously transforming both the world of printing and the world of the church. Surprisingly interesting. This certainly isn't a traditional biography of Martin Luther, nor does it delve too deeply into theology -- and in both respects, that was (for my purposes) all to the good. What author Andrew Pettegree focuses on instead, as indicated by the subtitle, is how the emerging technology of the printing press was critical to Luther's success, and how Luther was critical to the development of print publishing in 16th C. Germany. If that sounds like a somewhat arcane topic. . Surprisingly interesting. This certainly isn't a traditional biography of Martin Luther, nor does it delve too deeply into theology -- and in both respects, that was (for my purposes) all to the good. What author Andrew Pettegree focuses on instead, as indicated by the subtitle, is how the emerging technology of the printing press was critical to Luther's success, and how Luther was critical to the development of print publishing in 16th C. Germany. If that sounds like a somewhat arcane topic. . . well, I guess it is. But Pettegree writes clearly and well, and really knows his stuff, so although at times the book may be a bit repetitive and over-packed with details about 16th C. printing, in the end I felt that Pettegree provided some keen insights about the beginnings of the modern era in the West -- or perhaps I should call it the Era of the Printed Word -- that I should have learned in high school. I have a distant memory that my high school textbook mentioned among the *Important Events* of Western Civilization the invention of the printing press, the Reformation, and the beginnings of the use of vernacular across Europe, but I don't remember understanding the significance of these events or how they related to each other. Pettegree puts these pieces together, focusing on Luther as a writer/communicator/propagandist whose appreciation of the importance of print technology helped him become the most famous man in Europe. First, far better than his contemporary friends and foes, Luther quickly learned how to use printed books and pamphlets to spread his views widely and effectively. He obsessed not just about the words he wrote but about the timing, accuracy, visual appeal, and effective distribution of these printed works. Second, by writing in plain German, rather than in Latin, he increased his potential audience many, many times over. This was good for the local printers' pocketbooks, but it also was critical for Luther because it meant that many of his countrymen (notably including the elites who could help protect him and further his views) -- not just other Church men -- could understand his arguments. Just a few decades before Luther's birth, books were extremely rare and expensive objects that were hand copied, and therefore owned by only the wealthy few; but during Luther's lifetime hundreds of thousands of copies of his writings were printed and distributed throughout Germany. And a Church that for centuries was used to conducting academic theological debates in Latin did not always have a ready response. I had no idea before reading this book about the impact Martin Luther had on the German printing and publishing industry. Highly recommended! I was tempted to get this book because of a positive review and I am immensely thankful to the reviewer. I have read several books on Luther but this is probably my favourite. Andrew Pettegree is a professor of modern history at the University of St Andrews and the founding director of the St Andrews Reformation Studies Institute. He knows his stuff! This is not just a biography of Luther, but rather a look at how the printing press and Luther's gifts combined to create a revolution. It is I was tempted to get this book because of a positive review and I am immensely thankful to the reviewer. I have read several books on Luther but this is probably my favourite. Andrew Pettegree is a professor of modern history at the University of St Andrews and the founding director of the St Andrews Reformation Studies Institute. He knows his stuff! This is not just a biography of Luther, but rather a look at how the printing press and Luther's gifts combined to create a revolution. It is superbly written, historically detailed (and accurate) and because of its depth provides a real new perspective and fresh insight on Luther (even on the question of Luther and the Jews). This is first-rate history, politics and theology. Highly recommended. Pettegree provides a fresh perspective on the history of Martin Luther and the Reformation coming at it from a unique perspective--the printing industry of Luther's era. One of the best new historiographical contributions to the lead-up to the 500th anniversary celebration of the Reformation this year. I read this book for book club and didn't realize it was more about the Reformation's influence on printing in 16th C Germany than about Luther. As such, it wasn't bad, though I wasn't too interested. It went through Luther's life completely, but much of his doctrine was just hinted at. A disappointment for me. Nicely written. Easy to understand. Some repetition. Fascinating first half, second quarter was somewhat boring and too much into the weeds, last quarter pretty good. izsmeļošs vēsturisks ieskats reformācijā un norisēs, kas 16. gadsimtā Mārtiņu Luteru padarīja par zvaigzni ne tikai reliģiskajās, bet arī publicistikas debesīs. meistarīgs savijums starp reformācijas norisi un idejām un to, kā attīstījās vietējā izdevējdarbība, pateicoties Lutera publikācijām un aicinājumiem apšaubīt Katoļu baznīcas pieņemto kārtību. An interesting idea connecting print and Luther together as both were on the rise. In this book we learn about Martin Luther's place in the Reformation. This book also tells the story of books. And the impact Martin Luther had on the publishing industry in Europe in the sixteenth century. Martin Luther was not only a theologian but a writer of great skill, as well as a preacher. Martin Luther's early years in Wittenberg were a time of exploration and discovery. Between 1518 and1519 Martin Luther became a public figure. His new place as a public figure would lead to trips outside of Wittenberg both short and longer more arduous journeys. We learn in this book that the Reformation brought books into the hands of those who could only dream of owning books before the Reformation. This book not only talks about Martin Luther's place in the Reformation but the role he and his writings played in bringing life to the printing industry. I received an advanced copy of this book through Penguin Random House First to Read. I am a history buff. Always have been. I have a degree in history, concentrating on women's history. But my second love in history is religious history and that's why I requested this book and was so excited to have been chosen to read and review it. Martin Luther and the Reformation are intriguing and exciting to read about. One man, having qualms with the Catholic Church and the Pope brought about a huge chang I received an advanced copy of this book through Penguin Random House First to Read. Excellent look at the Reformation through the use of the printing press. Pettegree's major points are that Luther, as the first best selling modern author, parlayed his use of German (not Latin) and brevity to produce a long series of printed successes. Catholic writers stuck to long, dense arguments in Latin, which meant printers had much higher risk when they produced those works. As much as the printed works did involve theology, Pettergree does not waste time rehashing the long-dead argument Excellent look at the Reformation through the use of the printing press. Pettegree's major points are that Luther, as the first best selling modern author, parlayed his use of German (not Latin) and brevity to produce a long series of printed successes. Catholic writers stuck to long, dense arguments in Latin, which meant printers had much higher risk when they produced those works. As much as the printed works did involve theology, Pettergree does not waste time rehashing the long-dead arguments, instead focusing on the Luther Brand that guaranteed printers their profits. Not only was printing profitable, but keeping indulgence money in Germany brought the backing of local nobles--even those who remained Catholic all their lives. Far be it from me to criticize the work of someone with the breadth of learning possessed by Andrew Pettigree; I've read his The Book in the Renaissance, which is great. This one is not: there's almost no narrative and almost too much about dozens of German printers whose names flee from one's memory after a page is turned. Also--if you aren't familiar with Luther or what he did, this book won't help. Pettigree assumes you know about Tetzel, indulgences, justification by faith alone, etc. He als Far be it from me to criticize the work of someone with the breadth of learning possessed by Andrew Pettigree; I've read his The Book in the Renaissance, which is great. This one is not: there's almost no narrative and almost too much about dozens of German printers whose names flee from one's memory after a page is turned. A view of Luther's life through the lens of publishing. Especially good for those with some familiarity with Luther's life as there are all sorts of goodies I have never seen in other biographies. Excellent. I loved this book. It caused a mind explosion. Andrew Pettegree has done an excellent thing for all of us living in our time to understand how significant Martin Luther was to contributing to the information sharing that continues today. Read this book. 1. The author's writing style is easy to follow and understand. He presents his vast knowledge together in very readable prose. 2. The lens of the 16th century publishing industry provides a fascinating perspective on the Reformation. Much has been written on the theology of Luther, but Pettegree, while not ignoring the theology, offers insight on the other factors that were at play in shaping the evangelical movement. 3. I love books and thus I enjoyed hearing h I really enjoyed reading this book. 3. I love books and thus I enjoyed hearing how Luther creatively used the relatively new medium of book publishing to send the message of the gospel far and wide. He was a gifted writer and he used that ability to reach the people of Germany. 4. While appreciating what Luther accomplished, Pettegree also documents the casualties and collateral damage of Luther's actions. Luther's personality made him uniquely suited to lead a movement, but it also caused some people to get plowed over in the process. 5. Lastly, one of the appeals of this work is that it made the times and people real. Luther is pulled out of legend and into real life, but without crushing the legend. He corrects the record on a few points, and thus helps one have an accurate view of the life and times of this great man. There's a newish trend in history writers. They're taking a person's life and instead of writing a long biography, they take a shorter period and look in depth. British author Andrew Pettegree has done just this with his book about Martin Luther, "Brand Luther", where he examines Luther's influence on both religion and in the book publishing business. Not the most common combination but one splendidly presented in Pettegree's book. Martin Luther was a monk-on-the-rise at the eastern Germany city There's a newish trend in history writers. They're taking a person's life and instead of writing a long biography, they take a shorter period and look in depth. British author Andrew Pettegree has done just this with his book about Martin Luther, "Brand Luther", where he examines Luther's influence on both religion and in the book publishing business. Not the most common combination but one splendidly presented in Pettegree's book. Martin Luther was a monk-on-the-rise at the eastern Germany city of Wittenberg. Becoming well-known for pushing against the Catholic Church's selling of clerical indulgences to lessen one's time in purgatory, Luther was also a prolific writer. He wrote about religious matters in both Latin and the vernacular, German. In 1517 he posted his 95 Thesis on the door of the main church in Wittenberg and from there, questions began to be asked. Pettegree examines Luther's gathering influence on the Church and politics. He shows Luther's good points and his bad one's, too. Pettegree doesn't try to whitewash Luther's anti-Semitism. This was a really interesting and engaging look at print and the Reformation. It includes a wealth of information and uses an engaging, entertaining style to paint a vivid picture of Luther and Reformation Germany. There were some weak points. It seemed a bit in the throes of an identity crisis: Pettegree couldn't quite seem to decide whether he wanted to write a church history or a book history, whether this was a history of Luther through the lens of print or a history of early modern printing This was a really interesting and engaging look at print and the Reformation. It includes a wealth of information and uses an engaging, entertaining style to paint a vivid picture of Luther and Reformation Germany. There were some weak points. It seemed a bit in the throes of an identity crisis: Pettegree couldn't quite seem to decide whether he wanted to write a church history or a book history, whether this was a history of Luther through the lens of print or a history of early modern printing through the lens of the Reformation, and consequently there'd be chunks of church history with no tie to printing and chunks of book history with no obvious tie to religious reform. Just at times a bit clunky. Also, the logic could be circular sometimes. The Reformation was a populist movement because Luther wrote in the vernacular, but Luther's vernacular works were popular because of the Reformation's populist appeal. Not always clear in the chicken or the egg. The main thesis of this book is to describe the impact of the Protestant Reformation on the emerging printing industry in Germany. It spends some time describing the impact the other way, as well, but it spends most of its time explaining how Luther created a printing hub in Wittenburg and the effects his influence had on printing elsewhere. Approximately the first half of this sums up the events before the Reformation in Luther's life, and the early Reformation. It's clear that the author views The main thesis of this book is to describe the impact of the Protestant Reformation on the emerging printing industry in Germany. It spends some time describing the impact the other way, as well, but it spends most of its time explaining how Luther created a printing hub in Wittenburg and the effects his influence had on printing elsewhere. Approximately the first half of this sums up the events before the Reformation in Luther's life, and the early Reformation. It's clear that the author views this as catching their readers up so they can talk about what the really care about, the printing industry and the design of the Reformation pamphlet. As a result, the first half of this book is extremely dry. It reads like a boring textbook. The second half picks up, a genuinely passionate essay about the printing industry and how Luther morphed it to suit the needs of his growing movement. I would recommend this book to those interested, but be aware that the first half is a boring slog. After reading this book based on (the Tides of History podcast host) Patrick Wyman's recommendation, I agree with his opinion that he would be an "Extremely Online" guy (for reference: https://twitter.com/patrick_wyman/sta...). Luther was relentless and prolific like the best (worst?) people on Twitter, and even had a quasi-Milkshake Duck moment when he Both Sides'd the Peasants Revolt. ...okay, so Luther isn't the only one who is hypothetically Extremely Online. But he's also much more than tha After reading this book based on (the Tides of History podcast host) Patrick Wyman's recommendation, I agree with his opinion that he would be an "Extremely Online" guy (for reference: https://twitter.com/patrick_wyman/sta...). Luther was relentless and prolific like the best (worst?) people on Twitter, and even had a quasi-Milkshake Duck moment when he Both Sides'd the Peasants Revolt. ...okay, so Luther isn't the only one who is hypothetically Extremely Online. But he's also much more than that. My schooling and upbringing (what up, Jews!) didn't necessarily do a lot to explain the importance of the Reformation, so this book, in addition to Patrick's podcast, did a lot to correct that information gap for me. Beyond the theological impact, the Reformation had profound political, economic and cultural impacts. The movement touched on German nationalism, the printing industry, and women's education, among many others. I really like the way Pettegree weaves all that in. The book loses a couple points for me because its organization is a little over the place for my tastes - bouncing between ideas and timelines, the effect takes away a bit from telling the cohesive story of Luther. But maybe that's because it's really hard to measure the true full impact of Luther's actions and ideas. I began my career working on aspects of the European Reformation. My first book was a study of religious refugee communities in the sixteenth century, and since then I have published on the Dutch Revolt, and on the Reformation in Germany, France and England, as well as a general survey history of the sixteenth century. In the last years the focus of my research has shifted towards an interest in t I began my career working on aspects of the European Reformation. My first book was a study of religious refugee communities in the sixteenth century, and since then I have published on the Dutch Revolt, and on the Reformation in Germany, France and England, as well as a general survey history of the sixteenth century. In the last years the focus of my research has shifted towards an interest in the history of communication, and especially the history of the book. I run a research group that in 2011 completed a survey of all books published before1601: the Universal Short Title Catalogue. This work continues with work to incorporate new discoveries and continue the survey into the seventeenth century.